starring Loud and Clear’s Josh Dylan as the young Bill is in cinemas from today! 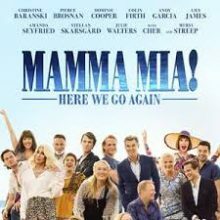 Five years after the events of Mamma Mia, Sophie learns about her mother’s past while pregnant herself. In 1979 young Donna, Tanya and Rosie graduate from Oxford University — leaving Donna free to embark on a series of adventures throughout Europe. On her journeys, she makes the acquaintances of Harry, Bill (Josh) and Sam — the latter whom she falls in love with, but also the man who breaks her heart. In the present day, Donna’s young daughter Sophie now dreams of renovating a taverna while also trying to figure out who is the biological father of her unborn baby. Mamma Mia 2 basically does what it sets out to do. It fills the most jaded heart with joy it’s an unashamed cheesy sensation that will please the fans but will never win over the doubters. But then again, it was never for them in the first place.